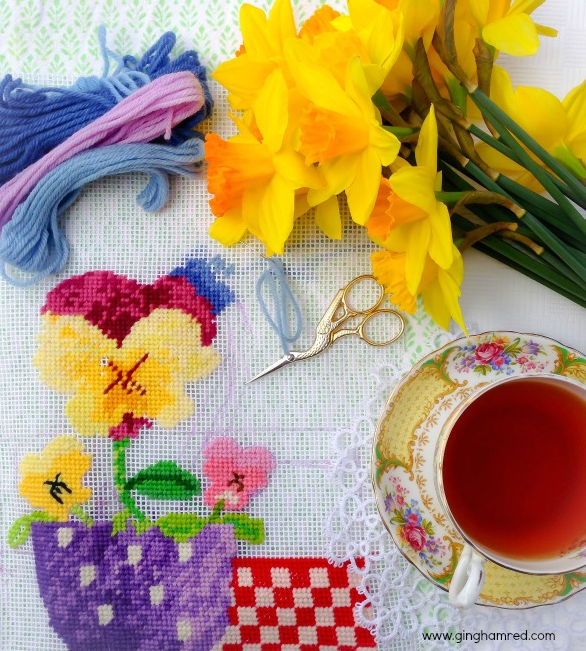 How many sewing or stitching projects do you start that you never finish? Or projects that you start and then put down and leave in a cupboard for months and months. We all have those half finished projects lying around the house. There is always another new project to start. 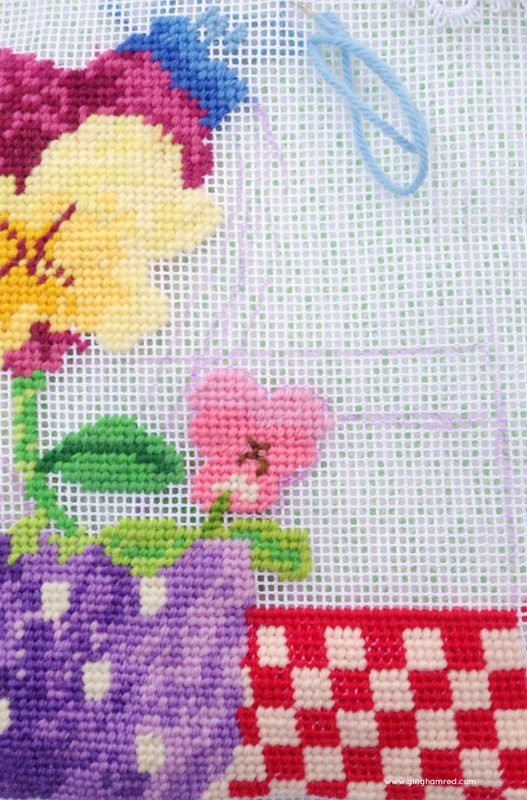 The pansy needlepoint I designed and started working on in August of 2014 is one such project. Needlepoint is one of my favorite things to do. It’s relaxing and lovely to work on but it does take alot of time. 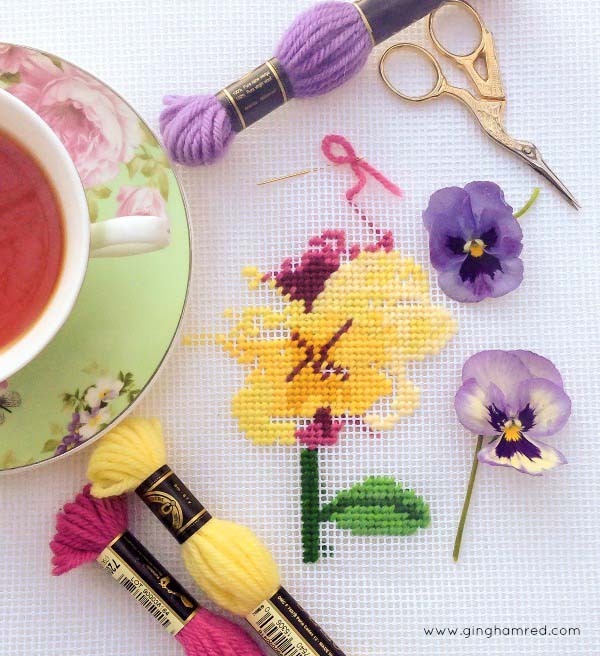 On Saturday afternoon I was inspired to pick up my abandoned pansy needlepoint project again. It’s so lovely to work with wool and canvas again. Seeing the design evolve slowly stitch by stitch. 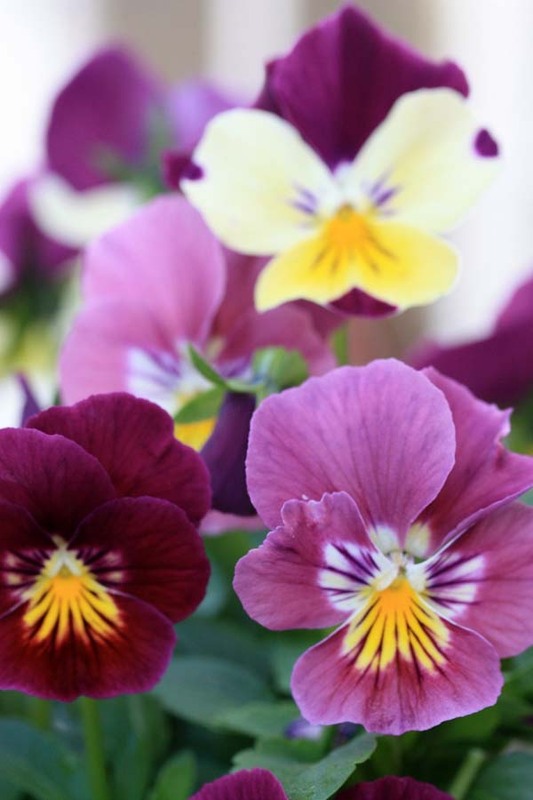 This piece was born out of my love, or rather, obsession with pansies and violas. I am using DMC wool and 10 count white canvas. 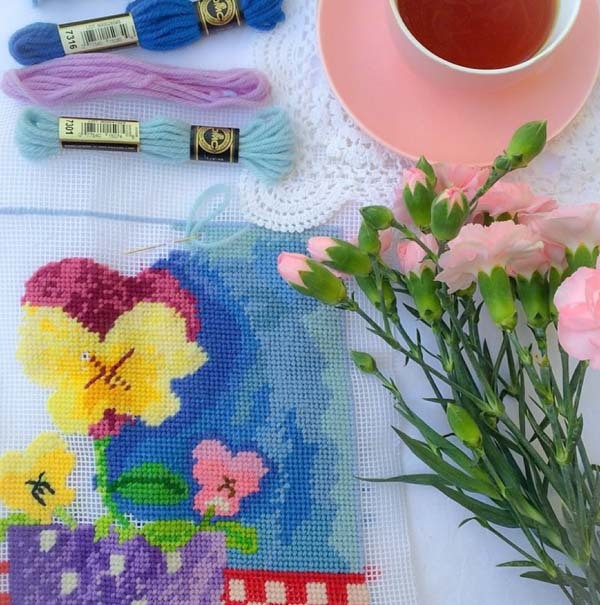 I usually draw my needlepoint design directly onto the canvas with a water soluble pen. Taking an idea from my head and then jumping right in is my preferred way of working. You could argue that this may not produce the “best” result. I could spend hours drawing or painting the design first, perfecting every angle and color combination. Yes, I could but that would take much too long. It’s about the enjoyment of stitching and working with the canvas, needle and thread as the design slowly unfolds. It’s lovely to see how an idea that was swirling around in my head turns into reality. The photos below show the progress of this design from the beginning to now. I am determined to finish this needlepoint as soon as possible. There is a new design floating around in my head! Have a great weekend. I hope you have time to pick up one of your unfinished projects this weekend!